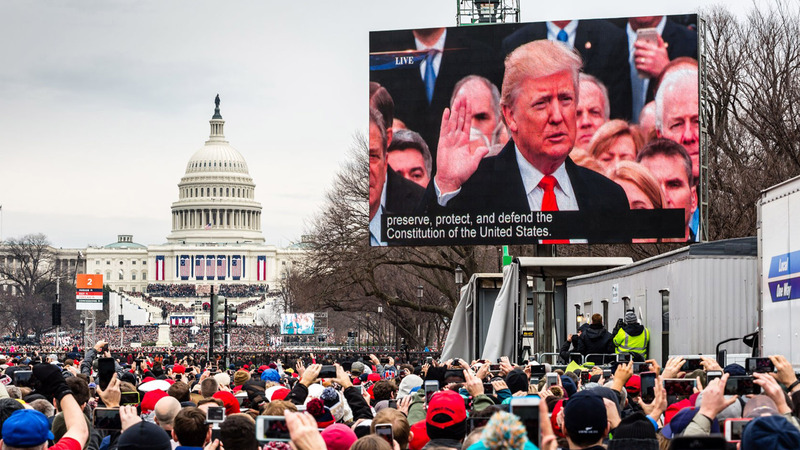 It all seemed like a dream, at that moment, January 20, 2017, 12 noon, when Donald TRUMP took the oath of office through his allegiance to the Constitution. It was also at that moment that we entered into a phantasmagoria, a surreal chapter in the annals of American history, in which we have seen the collapse between the real and the imaginary. So much has already been said and written about TRUMP, ad nauseum. This is precisely his intent, to burrow himself deep into the consciousness of the body politic, until we are so utterly fatigued, so fed up, so unnerved, that we no longer resist. TRUMP has lodged himself into the global zeitgeist, well beyond America. He has penetrated the minds of everyone, everywhere, within earshot of the media. His aim is to distort our perception of reality by blurring the difference between truth and fabrication, at the very nexus of our democratic system. With each lie, each exaggeration, each false twist of the truth, TRUMP closes the distance between the real and the imaginary. But this has hardly been thought through. TRUMP’s omnipresence is that of a blindly mad narcissist playing the role of a demagogue in a reality show, which is extemporaneously performed in the Oval Office each and every day. It is an improvisational tour de force that plays out on the grand stage of the White House, in which we are ALL watching, ALL fixated, ALL tuned in, ALL the time. We must do more than resist, we must understand this phenomenon that is boiling up in the body politic. TRUMP preys on our reality, and loss thereof. How? By refuting the facts, the truth, declaring the media as fake when challenging his fantastical narrative. In doing so, he collapses the space between truth and fiction, the real and the imaginary by eroding the distinction. TRUMP is a torrent of contradiction, a ship without a rudder, a leader without a moral compass. He is a performer constructing a gesamtkunstwerk (total artwork) built solely on the power of the suspension of disbelief. TRUMP is a breakdown of the real. When efforts to authenticate are declared fake, when there is no longer any separation between that which is real and that which is not, systems of shared belief (i.e. democratic ideals) are unraveled. In the face of this post-real obscuration of truth, reality collapses. TRUMP is now using the Presidency to lure us all into his fake world of pseudo-greatness, the cult of celebrity, or as Michael Moore calls it: TRUMPland. In TRUMP’s world, criticality withers. Democracy is founded on clear and distinct polarities: right and left, Democrat and Republican, right and wrong, which allow for debate, argument, and reason. But TRUMP is intent to abolish all that. Not through some through-composed Hitlerian Mein Kampf ideological system of German supremacy, but out of a wildly impulsive, self-absorbed need to be rooted at the center of the public consciousness. If we are going to preserve our freedoms in this dystopic time, we must, above all, defend reality against its demise.